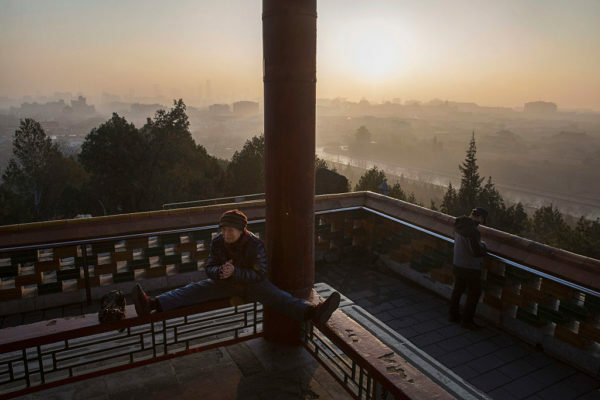 While people in Beijing enjoyed the benefits of a record air pollution drop this winter, those in the provinces were left unable to keep warm, cook or sleep for lack of heating. Reports on the heating crisis that was triggered by the government’s anti-pollution drive have largely focused on the areas surrounding Beijing, but mapping of social media data by Unearthed now shows that people were complaining of the cold more than 1,000km away. “The heating in my home is not working, I’m freezing and shaking, rushing to go to sleep,” one user posted at 02.33am on Weibo, one of China’s most popular social media sites. There were reportedly millions of people who experienced the unintended consequences of the government’s drive to cut pollution in northern China this winter. The latest data shows that is has certainly worked. Beijing’s smog has dropped by a record 54% in the final quarter of 2017, compared to 2016. But implementation of the government’s target to switch millions of households from coal to cleaner energy was hampered by high demand, overzealous local officials and a separate government policy drive to eliminate small industrial coal burners. 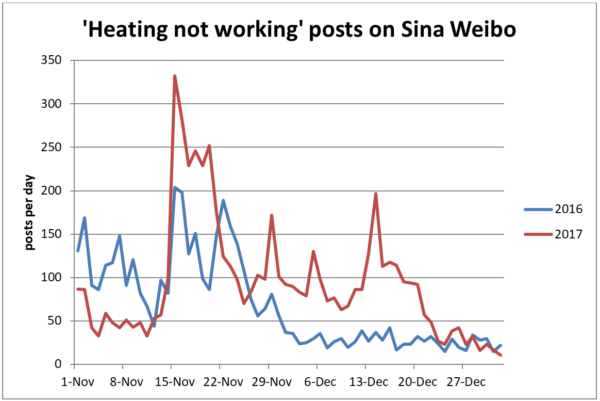 An Unearthed analysis of Weibo in November and December, revealed 5,822 posts by users complaining that their heating wasn’t working. It shows that there were three times as many such posts made in December 2017 as in December 2016. Researchers looked through posts on the social channel to find the most common and relevant ones and then downloaded data for the number one search suggestion for people reporting that their heating is not working. They then isolated a small subset of posts in which users had mentioned where they were based and used those to build the map. Although reporting on the heating crisis has focused on the areas around Beijing, geolocation of posts citing place names shows the problems were much more widespread. Complaints were recorded as far south as Qingdao and Xi’an, 1,000km from Beijing. Posts hit a sudden spike in mid-November, at the start of the heating season, when community heating normally starts and gas supply becomes available for homes. Most days for the following month recorded more than 100 posts per day. “I’ve paid all the fees but I’m not getting gas for heating. Every day the gas is cut from 5pm to 8am. During the daytime the heating is also too cold. Some people reported that the air still seemed toxic. “Heating is not working but the smog is also severe?”, said user Jevouseclaire. But data shows that levels in the region around Beijing dropped by a record-breaking amount over the winter, in the wake of major industrial shutdowns. Others did report noticing a difference in the air quality, despite the heating crisis. “There’s indeed less smog but the heating in the classroom is not working, air conditioning in the library is not working, the teapot and the bathroom don’t have hot water, you’re not allowed to use coal yet there is no gas,” reported one user. The number of complaints started falling around December 21. Social media users continue to report problems with heating, but the number of complaints has fallen close to the rate seen the year before, suggesting that the government is now getting on top of the issue. But next winter the government wants to implement even more ambitious clean heating targets. Can they do so without creating another crisis?